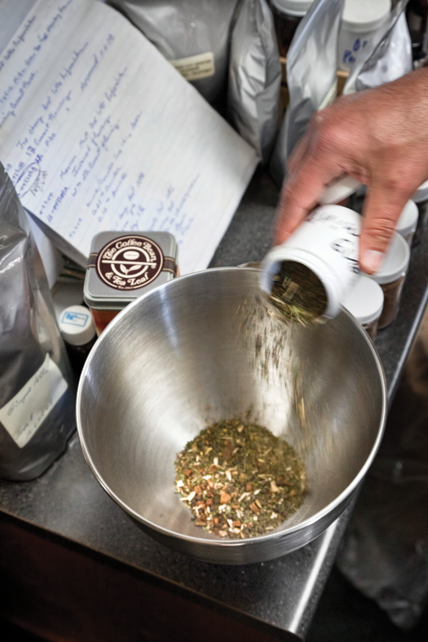 ‘‘The perfect tea starts with nurturing partnerships half a world away." Tea is the most consumed beverage on Earth (besides water, of course). The Coffee Bean & Tea Leaf® is here to bring you the perfect version of the world’s favourite drink. As you’re sipping(experiencing) one of our brews, know that the liquid gold in your cup began its journey thousands of miles away, on the lush tea plantations of Sri Lanka, Kenya, China, Japan, Thailand and India. The Coffee Bean & Tea Leaf® works directly with tea growers in these regions in handcrafting varieties of tea that meet our desired specifications. Thus we(CBTL) make sure that you enjoy highest quality whole-leaf teas and tea drinks available anywhere, brew for brew, cup for cup. On the road to tea perfection, we insist on buying directly from the growers, without middlemen, wholesalers, or importer-exporters. 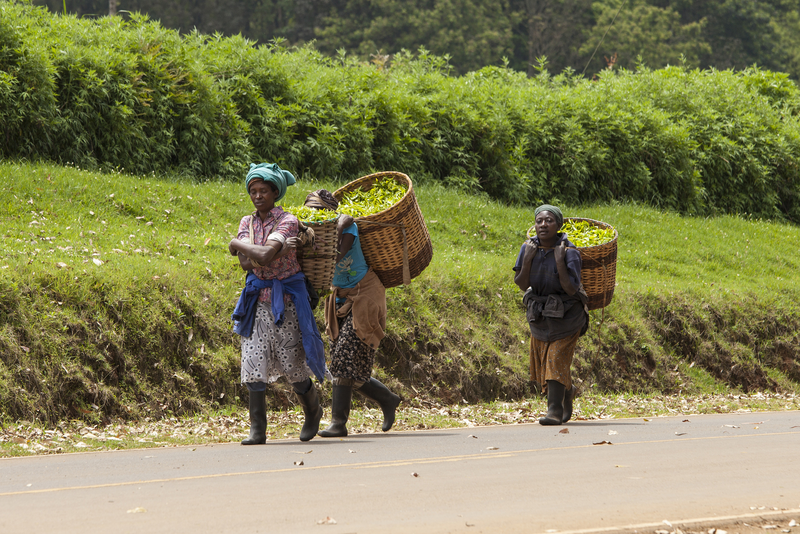 This isn’t only about doing what’s right, it’s about staying connected to the harvest, so that we can source and deliver the world’s finest, most distinctive teas. It also keeps us connected to the people for whom tea is a source of livelihood. Our commitment to local tea growers goes beyond paying fair wages; it means giving back to the plantations, estates and communities that grow our tea by supporting local education and health-care programs. Cultivating such close ties to community benefits everyone, from the local growers to our global customers who get to drink in the delicious benefits of our partnerships. 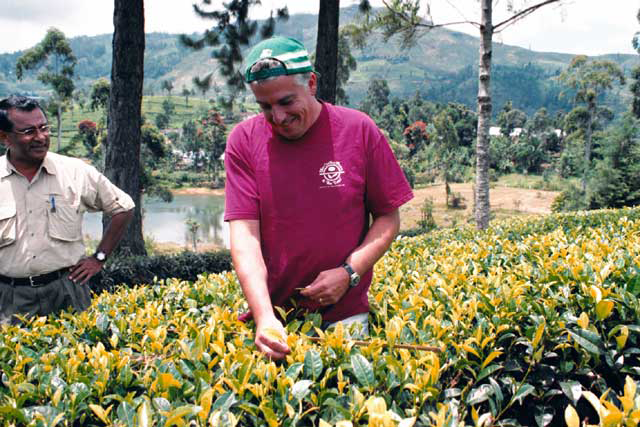 Our Master Tea Buyer-Blender David De Candia is an industry pioneer who travels the world in search of the best. David is regarded as a trailblazer in the art and business of all things related to tea, and over the years, he’s joined forces with charitable organizations dedicated to the tea estates and communities where our teas are grown. He is a co-founder and a director of the Aid Lanka Kids Foundation and spearheads numerous community welfare initiatives at many of our tea growing regions. 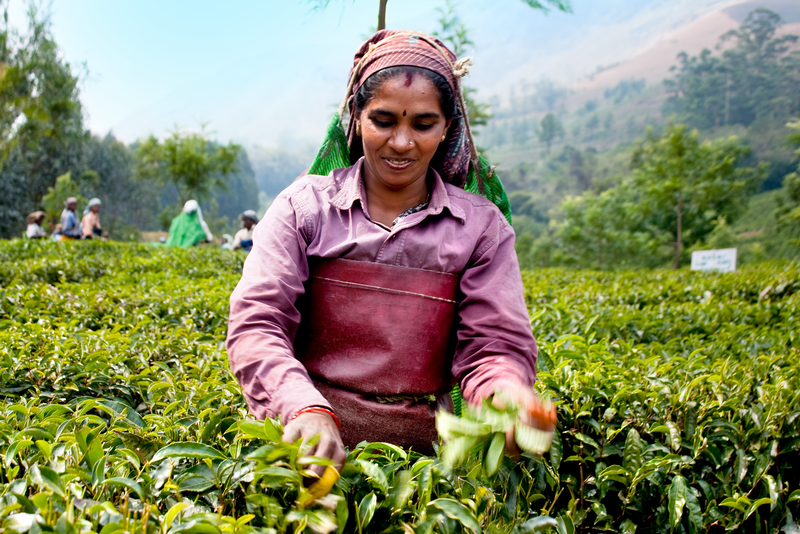 Home to the celebrated Ceylon black tea, Sri Lanka is the world’s 3rd largest producer of tea. 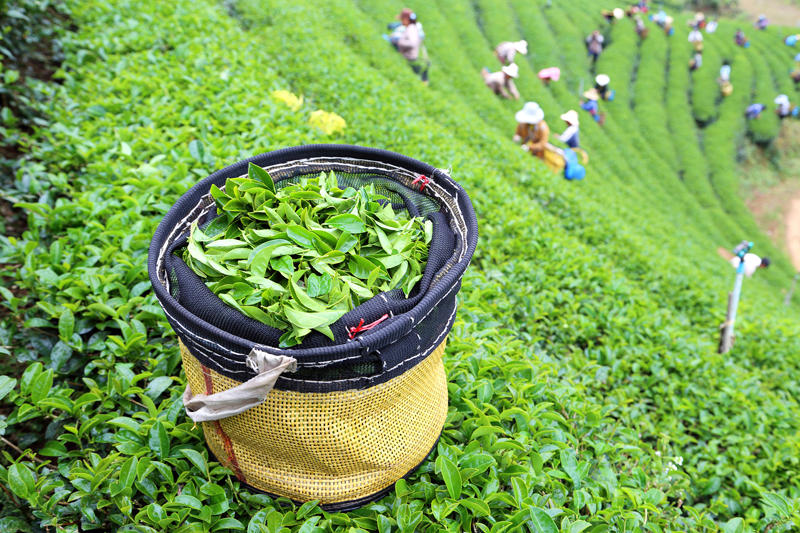 The tea industry employs more than a million of the nation’s people. 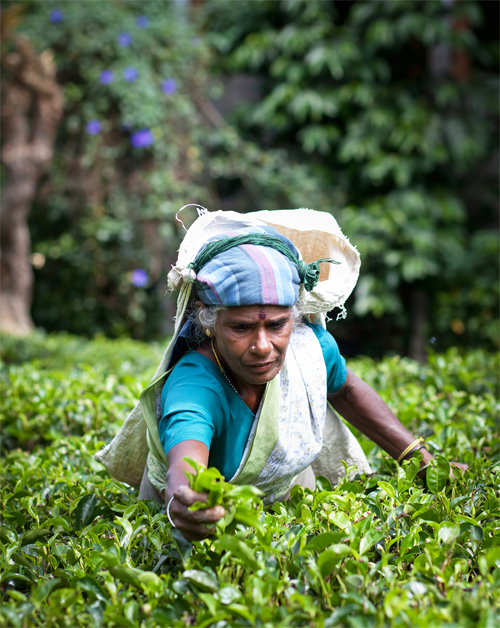 With its tropical locale, Sri Lanka benefits from the perfect weather for growing world-class tea the year round. The highland teas, which are highly desired for their well-matured aromas and taste, are grown at an elevation between 3500 and 7500 feet. Growing this singular black tea is a process mastered since the first 100% pure Ceylon tea was produced here in 1867 by Scottish planter, James Taylor. All of our Ceylon black teas, along with our Limited Edition Green Ceylon Tea, hail from the world-famous Bogawantalawa Estate in Sri Lanka. In fact, we even have our own reserve growing area there -- in Field 17 of the gorgeous, one-and-only Loinorn Garden, recognized as one of the prime producing gardens in all of Sri Lanka! The proof’s right there in every glorious cup. Tea had gone to Kenya from India in 1903, and since then, this East African country has grown to become the 2nd largest tea producer in the world, producing a distinctive black tea that ranks with the best the world has to offer. Kenyan culture is steeped in the ritual of tea drinking, and the locals enjoy it with cream and sugar. Kenya prides itself on producing the best quality black tea in the world. 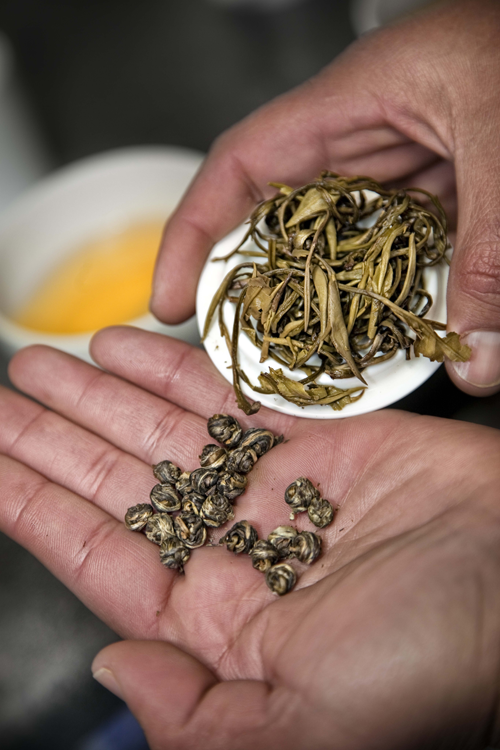 Only the bud and the two selected upper leaves of the plant is hand-plucked before the tea is skillfully manufactured under the most stringent conditions to ensure the best quality product possible. Due to strict planting guidelines, Kenyan tea is all natural, with no pesticides or other added chemicals. The materials that go into sowing and growing tea plants are carefully selected by an expert production team, guaranteeing that only quality, high-yielding clones, resistant to pests and disease, are planted. The Coffee Bean & Tea Leaf® is the first U.S. company to buy tea from Kenya’s renowned Mukengeria Tea Estate, located on the gorgeous slopes of Mount Kenya in Kangaita in central Kenya. With its nutrient rich volcanic soils, this tropical region is ideal for tea growing, and you’ll taste Mukengaria’s distinctive flavor and character in every sip. Nestled at an elevation between 3,900 and 5,000 feet, this is the home of the storied, family-run estates of the 101 Tea Plantation, along the tea-growing hills of Thailand. Established in 1901, the 101 Tea Plantation (the ‘101,’ by the way, means “best” in local dialect) is regarded as the master producer of 100 percent organic green and oolong teas. The 101 Plantation also holds equally renowned, high-quality tea gardens in the Mae Salong region of northern Thailand – where their estates have helped the Thai Royal Family convert the local crop from opium to tea – and in the Yunnan district of China, the world’s oldest tea-growing region dating back 1,300 years. What’s so amazing about the Yunnan estate is how 101 Tea Plantation has been able to blend the local tribes’ ancient method of tea harvesting with modern production techniques. The estate grows tea in cooperation with the local Dai, Lahu and Bulang communities, for whom tea is an essential part of daily life. And these aren’t your typical tea gardens, either, but ancient tea forests – the trees here are a thousand years old. Workers must scale these towering tea trees to pluck the leaves and buds, before the tea is processed using modern oxidation techniques that bring out their full richness of aroma and flavor. The Chamong Group is almost as legendary in the world of tea as the regions in which their world-famous brew is produced. Established in 1916 and now entering its sixth generation, the family-run Chamong Group owns tea estates in Darjeeling and Assam, in northeastern India. Both these exotic regions are fabled as much for their immaculate, timeless beauty as their dazzling varieties of black tea. In Darjeeling, Chamong runs five estates, and thirteen in Assam, and these estates are the exclusive sources for all our Darjeeling and Assam black teas. Green, black and oolong teas all have very distinctive flavors and aromas so it’s critical to understand how each will react to the other as we hand-blend them to create adventurous new flavors. Our exclusive blends are crafted to bring out the singular flavors in each component of our teas. Take Pomegranate Blueberry, one of most beloved blends, as an example. 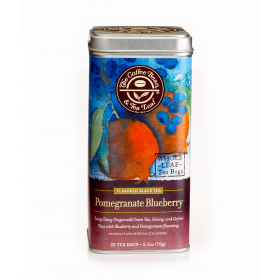 Pomegranate Blueberry combines three high quality teas (Ceylon, Oolong, and Lung Ching), all with distinct color and flavor attributes. Ceylon tea gives the blend the body and color, oolong gives it the floral notes, while the Lung Ching, with its earthy and grassy flavor, counterbalances the other two to perfection. Tea cupping or sensory evaluation is a process of utilizing human senses to appreciate and evaluate tea. 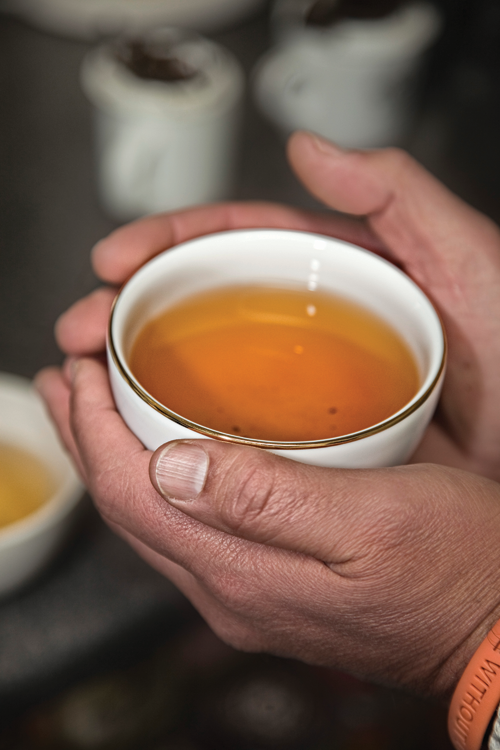 Because quality can vary depending on its origin and the way tea is processed, tea buyers use this technique to determine quality and compare teas. Tea cupping is not just for tea professionals; tea enthusiasts often cup to deepen their appreciation for teas. Eight of every ten cups of tea being enjoyed right at this moment are cups of black tea. With its fully oxidized punch, black tea has the highest caffeine content of all teas, and a strong, full-bodied flavor that awakens the senses. 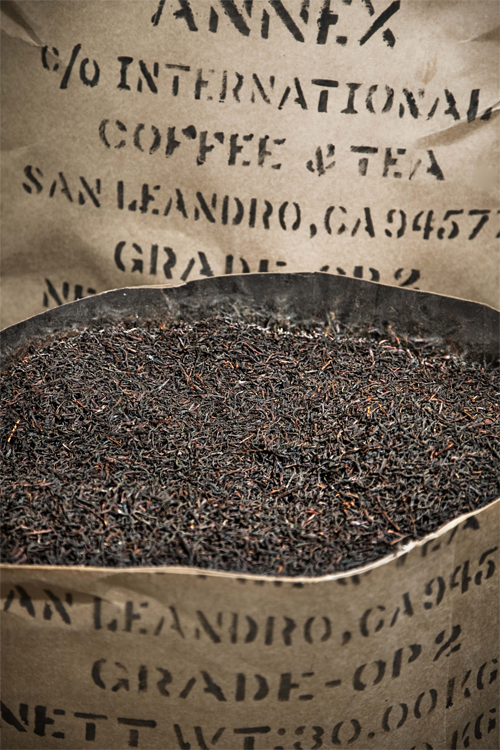 Black tea is made all over the world - from China to India and Sri Lanka to Africa. Here's how they do it: Once the tea leaves are plucked, they are dried to evaporate most of the water content. This process takes about a day. Next, the leaves are rolled, and their surfaces cracked, allowing the oils and enzymes to react with the air, or get oxidized. The leaves are left there to be roasted, till they turn completely black in color, signifying the completion of the oxidization process. 'Workers then dry out the leaves some more, getting rid of the last bit of moisture, then sort out the leaves, putting them through a quality control process before they package and ship them to your friendly neighborhood Coffee Bean & Tea Leaf®!' - the leaves are further dried to get rid of the remaining bit of moisture, put through the quality control process and packaged and shipped to your friendly neighborhood Coffee Bean & Tea Leaf®! Quick, whats the most popular drink in India? Coffee? Nope. Tea? Close. Try Chai. On every street corner in India, Chaiwallahs hawk their special blend. We offer a traditional Indian Chai that uses only the finest ingredients. We blend black tea, cinnamon, clove, and cardamom. 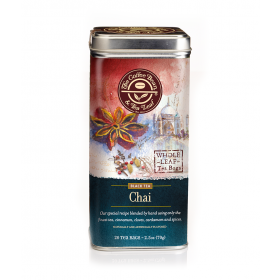 Exotic, aromatic and deeply relaxing, Chai is the drink of a continent. One billion Indians can't be wrong. It's how the English wake up and warm up on that cold, rainy, sceptered isle. Our original recipe combines Darjeeling and Bogawantalawa Estate tea leaves to produce a balanced cup with medium body and brisk flavor. A perfect complement to your morning meal, try it with a spot of milk. We combined the mellow taste of Bogawantalawa Estate Ceyon black tea with the delicate flavor of apricot to produce this well-balanced tea. Delightfully ambrosial, with a fruity aroma and light body, this tea is perfect for a relaxing cup of bliss. One of the most famous and distinctive teas in all the world, Earl Grey derives its unique flavor from the oil of Bergemot, a Mediterranean citrus fruit similar to an orange. Named after the 2nd Earl Grey, a British prime minister who received this flavored tea as a gift and served it in his ministerial drawing rooms, the tea has been in continuous production since the 1830s. Enjoy it black or with milk. The romance of the South Sea Islands meets the strength of Chinese black tea in this tropical blend. We start with Chinese black tea for body and add notes of passion fruit, guava, and malva and marigold flowers. The result is a tea strong enough to be enjoyed as a latte, or as a traditional brew. The mystical tea terraces of China and Japan are part of what gives green tea its aura of mystery and ancient wisdom. Not just China and Japan, but Taiwan, Vietnam and Indonesia have also grown to become significant exporters of this much sought-after brew. With its pure, fresh taste, you might think it came straight out of the natural springs on earth and into your cup, steaming hot. For a fact unlike other teas, green teas are non-oxidized. Once the top two leaves and a bud are hand-plucked, the fresh leaves are steamed to halt oxidation. Steaming brings out the fresh, grassy taste and aroma we associate with green tea, and it also makes the leaves soft and pliable for sorting and rolling into batches. The whole process is carried out without machines, guaranteeing the delicacy of flavor you’d find only with handcrafted teas. If you like your green tea on the nutty side, try our playful Lung Ching variety. It’s an example of a green tea that’s pan-fried before being dried and sorted (other types of green tea may be pan-fried) to bring out that extra nutty nuance. 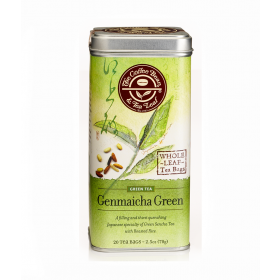 Whether you love green tea for its clean, earthy flavor or for its rich antioxidant benefits, The Coffee Bean & Tea Leaf® will satiate your senses with our superior-quality selection of whole leaf green teas. There's nothing quite like the distinctive taste of Genmaicha Tea, with its blend of green Japanese Sencha tea, partially toasted rice and popped corn. 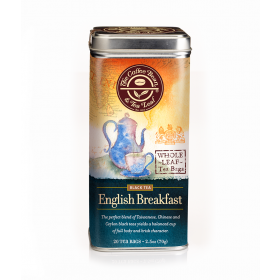 Refreshing and light, the tea retains aromas of toasted rice, which adds a body and sweetness to the finish. 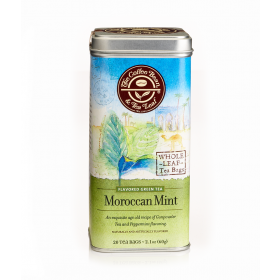 This invigorating green mint tea is handcrafted using a traditional Moroccan recipe first popularized in the 18th century. Handed down from the original tea traders of Casablanca, our version uses the finest Gunpowder Green Tea from China, flavored with richly aromatic peppermint. A classic pick-me-up from the bazaars of the old world, this intensely flavorsome tea is traditionally served with sugar in small glasses. Experience the tea of Emperors. This delicate green tea is revered by the Chinese for its jade green color and unique shape. 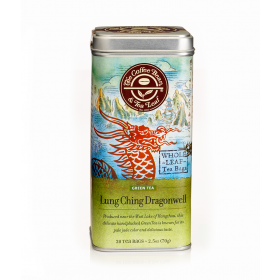 The only place in the world where Lung Ching Dragonwell tea is grown is in the West Lake district in Hangzhou, China. We make the tea the same way the Chinese have made it for centuries. The tea is meticulously prepared from tender leaves using a traditional handmade technique. If you want the best of both the green and black tea worlds, step right up for a heavenly cup of oolong tea. You won’t be sorry. Oolong tea leaves are only partially oxidized, which gives them a body and flavor characteristics lying somewhere between black tea and green tea, depending on the type of leaf and how long it was oxidized. Processing oolong tea requires a true craftsman, as every step needs careful timing and precision to create the tea’s balanced and complex attributes. As with all our handcrafted tea selections, the process begins by hand-plucking the top two leaves and a bud of the tea plant. The leaves are then dried outdoors to remove the moisture generated by the plucking of leaves, before they’re moved indoors for, you guessed it, more drying. The second round of withering is combined with gentle tossing which bruises the leaves, energizing their cell membranes and allowing for oxidation to begin. All this craftsmanship combined with the scientific processes is what influences not only the colour but also the radiant aroma of the leaves. After all the withering, tossing and bruising, the leaves are stir-fried ina large pan over high heat to stop the process of oxidation. While they’re still moist, the leaves are rolled and twisted. This rolling and twisting creates more bruising which, in turn, gives the leaves their unique color and flavor. After rolling, the leaves are allowed to dry – a step that’s sometimes repeated at different temperatures to produce subtle variations in taste. If you’re game for a dreamy spectrum of aromas and flavors, a cup of our is the order of the day. The magic begins with the steeping, which produces a lovely amber-brown liquor, distinctive to oolongs. Next comes the sip, which will introduce your taste buds to the tea’s smooth, complex notes. you want a rich floral essence? Oolong’s got it, along with finishing touch that can be alternately fruity and mildly nutty, complemented always by delectable honey nuances. There’s a new cult brewing in your neighborhood, and it’s all about the flavored and blended tea leaves at The Coffee Bean & Tea Leaf®. We blend and flavor all of our teas by hand to ensure the purest, vibrant, and most delicious tea you’ll ever introduce your taste buds to! 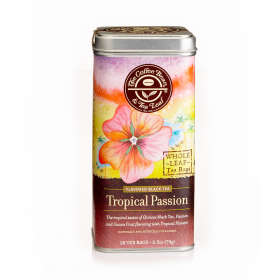 At The Coffee Bean & Tea Leaf®, we’re downright passionate about the art and craft of flavoring teas. Our dedicated tea tasters and blenders all have an expert knack (and a nose) for detecting and combining the nuances of flavors, and how each flavor blended with the right variety of tea can delight you with its dance of tastes and aromas. Green, black and oolong teas all have their own signature flavors and aromas, and each will have its own unique set of blends that complements and expands their essence. 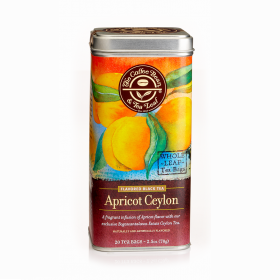 A mellow Ceylon tea, for example, blended with a delicate peach flavor works the magic sparks of fruitiness with a light floral finish. 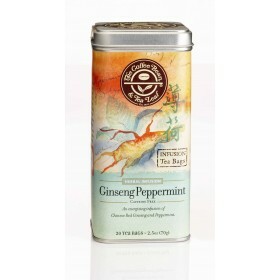 It’s the classic tea blend that has won fans and admirers the world over. But it doesn’t end there. Not by a long shot. The Coffee Bean & Tea Leaf® has so many delicious selections in our line-up of whole leaf flavored teas, you’re sure to find your favorite! Who knows? It could be the start of a beautifully blended friendship. Delightfully aromatic, with a fruity aroma and light body, this tea is perfect for a relaxing cup of indulgence. 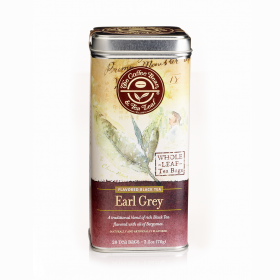 One of the most famous, and rightfully distinctive teas in all the world, Earl Grey derives its unique flavor from oil of Bergamot, a Mediterranean citrus fruit like an orange (in case you were wondering). 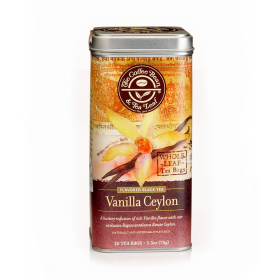 There's nothing plain vanilla about our Vanilla Ceylon infusion. This is a rich brew, built on a base of Bogawantalawa Estate Ceylon black tea, to which we've added sweet, buttery, vanilla flavoring. Enjoy this full-bodied tea as a tea latte, with milk or over ice. we combine reen, oolong, and black tea leaves, then infuse them with blueberry and pomegranate for a delightfully exclusive essense. Fresh, fruity and radiant with flavor, this tea exhibits bright berry notes and a naturally sweet finish. If you like your tea without that extra kick of caffeine, then the decaf and non-caffeinated selections we offer at The Coffee Bean & Tea Leaf® are your ticket to tea-drinking bliss. Our soothing, top quality whole leaf decaf tea lets you relax and enjoy your favourite flavors and aromas, because, to your convenience, these tea leaves are 97% caffeine free. The Buzz on Decaf Tea . . . There are two ways of removing caffeine from tea leaves. Both are natural because the chemicals used already exist in tiny amounts in the tea leaves to begin with. The first method of decaffeination uses Carbon Dioxide (CO2), and the other uses Ethyl Acetate. If you're curious and wondering, The Coffee Bean & Tea Leaf® exclusively uses the Carbon Dioxide method. Here, Carbon Dioxide is highly pressurized to give it the density of a liquid and the viscosity of a gas. Those qualities make Carbon Dioxide an excellent solvent for scrubbing up caffeine from tea leaves as the Carbon Dioxide is sent circulating through the tea. Lesser decaf tea leaves tend to be products of the Ethyl Acetate method. It’s similar to the Carbon Dioxide method wherein the high pressure is used to make a solvent out of the Ethyl Acetate, but, after removing the caffeine, the Ethyl Acetate is cleansed to be used continually. We love the idea of recycling, but when it comes to the processing our decaf teas, The Coffee Bean & Tea Leaf® subscribes only to the best methods, and that means using pristine Carbon Dioxide for the cleanest, best tasting decaf. Tantalize Your Taste Buds with Our Fruit & Herbal Infusions! Our Fruit & Herbal Tea infusions are delicious and indulgent ways to enjoy the experience of tea, but without any of the tea. That’s right. We call them teas, but they’re really not. Confused? Let us explain. Our Fruit & Herbal Teas are expertly hand blended drinks, derived from an adventurous array of dried fruits, herbs, flowers and spices. Made from our exclusive in-house recipes, Fruit & Herbal Tea Infusions can be enjoyed hot or iced. And did we mention? They’re 100% caffeine free. So sit back, relax, and treat yourself to these delightful flavor combinations that are sure to soothe the spirit, thrill the palette, and carry you off to exotic flavor destinations. Surprise, it's lemon grass. 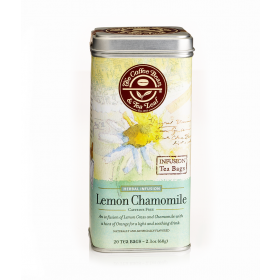 The delicate taste of lemon in our Lemon Chamomile tea comes from natural lemon grass, which offers the aroma of lemon without its bitterness. We combine lemon grass from Thailand with chamomile to blend a honey colored infusion. The result is an invigorating drink that includes an addition of orange peel that adds a delicate citrus flavour. Ginseng has long been prized by the Chinese, where the root is used in traditional medicine as a boost to the immune system and a tonic for the blood. Our herbal infusion offers a blend of Chinese Red Ginseng, eluthero root, peppermint and other herbs for a naturally stimulating energy drink. David De Candia is the resident guru of all things tea. Use this page to ask all your tea-related questions and David will answer them directly. Don’t be shy. Ask away! As the Tea Buyer-Master Tea Blender for The Coffee Bean & Tea Leaf®, David is one of the world's leading tea experts. He joined the company in 1998 as a warehouse manager before his ingenuity for tea made him the man solely responsible for the research, buying, blending and packaging of tea. David’s a globe-trotter, searching the world for the finest and best quality teas which he hand selects for use in our signature drinks. 1. What's the best way to steep our whole leaf tea? Ans. Start with fresh, cold water, either bottled or filtered. Bring the water to a boil and remove from heat. Then add one teaspoon of tea leaves per 8-oz cup of water into a teapot or infuser, or, if you’re using tea bags, immerse the tea bag directly into a 12-16oz cup. The steeping time depends on the type of tea, so take a look at the guidelines to see how long you should steep your particular tea. Keep in mind that each tea has its own special characteristics, so always be sure to consult the instructions printed on the label for best results. 2. I like my tea strong! Would steeping it longer make the tea stronger? Ans. Actually, no. Over-steeping your tea will turn it bitter. For stronger tea, simply add more tea leaves, or a second tea bag. 3. Why do you insist on our using filtered water for tea? Ans. We recommend bottled or filtered water because most of the impurities have been removed from it, so what you’ll taste is just pure, pristine tea. 4. What's the best way to make iced tea? Ans. For a 48oz. serving, follow these directions: Take four tablespoons* of tea and add to your tea filter. Next, place the filter in a container and fill with 48oz of hot filtered or bottled water. Steep the tea according to the steeping time recommended on the packaging. After steeping, remove the filter and let the tea cool completely. Keep the tea in the refrigerator to chill and serve/drink with ice. They don’t call it “ice tea” for nothing. * You may also substitute loose leaf tea with tea bags. Use 1 tea bag for every 16oz of water. 5. What's the best way to store tea? Ans. To ensure freshness, be sure always to store tea leaves in an airtight container. It’s best also to store the leaves in a cool, dry place away from direct sunlight. 6. How can I make a tea latte at home? Ans. Pour eight ounces of hot water in a 12-oz cup. Now add your favorite Coffee Bean & Tea Leaf® tea sachet or loose leaf tea, and steep the brew according to the directions on the package. After steeping, add 1/3 cup of our French Deluxe™ Vanilla Powder and stir well. For the final delicious touch, top off the tea latte with hot or steamed milk. Enjoy! 7. Do you have any suggestions for pairing tea with food? Ans. This is as delicate a question as asking what wines are best paired with which food. What food to pair with your tea depends on the characteristics of the tea in question. If you’re enjoying a flavored tea, you can pair it up with heavier and spicy foods. On the other hand, unflavored stand-alone tea has delicate aromas and flavors that can easily be overwhelmed by the wrong pairings. Lighter foods such as chicken or salad are your best bet for pairing with unflavored teas. For more pairing suggestions, be sure to check out theTea Pairing section of this website.